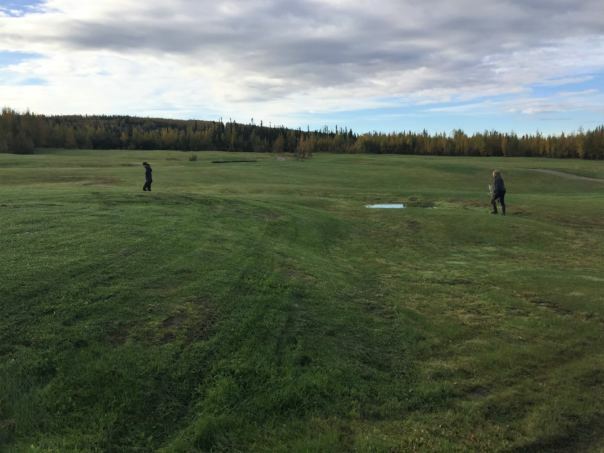 For golfers at the North Star Golf Club in Fairbanks, there’s an extra perk: if you come at the right time of year, you can find methane bubbles on the course. It’s been happening for the past two decades, according to Roger Evans, the owner. People regularly poke them with tees and light them on fire. In many respects, the North Star Golf Club looks like any other golf course: emerald grass dotted with ponds, idyllic forest on all sides, a flock of bothersome geese. But it’s full of dips and swells, like a pond frozen mid-ripple. That’s not by design, Evans said. Evans is out on his golf course in big boots, squelching through the waterlogged grass to help scientist Katey Walter Anthony and her two assistants find some methane bubbles. 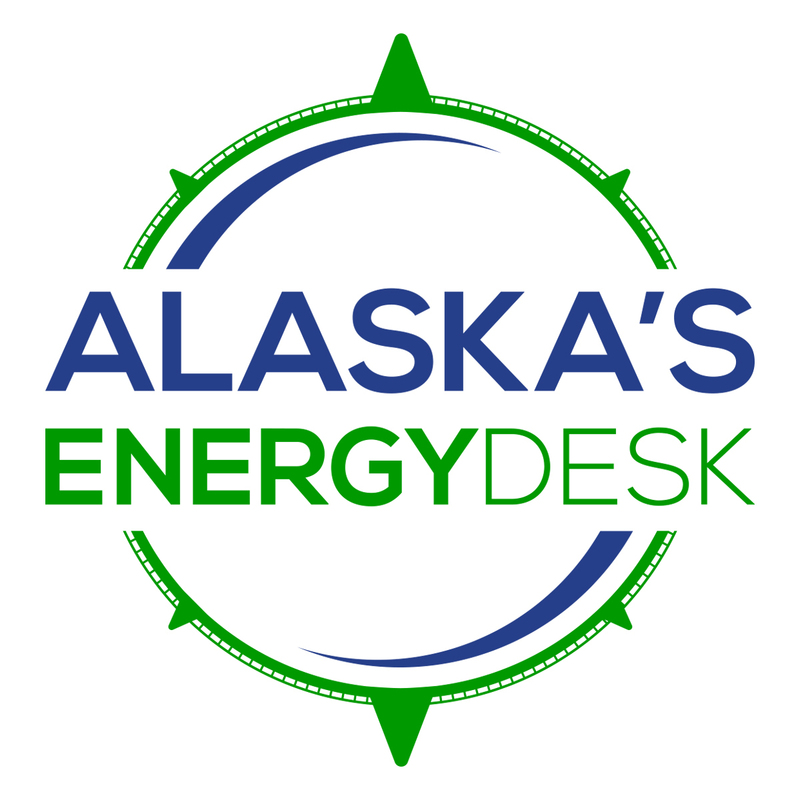 Walter Anthony is a research professor at the University of Alaska Fairbanks. She’s been studying methane bubbles in Alaska and Russia for almost 20 years. Walter Anthony says that the reason methane is being produced beneath this turf likely has to do with the permafrost thaw Evans described. That thaw triggers the breakdown of organic matter that has accumulated beneath the soil over thousands of years. “It’s like opening the freezer door, making it accessible to microbes that decompose it and turn it from organic carbon in the soil… back into greenhouse gases,” Walter Anthony said. Often the greenhouse gas released is carbon dioxide. But when the decomposition happens in an environment without a lot of oxygen, it can produce methane too. The most obvious place for scientists to look for that kind of methane is in lakes and wetlands, because standing water makes it hard for oxygen to get into the soil. That’s where Walter Anthony usually does her research. “To see and to hear about methane bubbles under grass in a golf course lawn is very different than the type of environment we’re normally sampling methane in,” Walter Anthony said. This golf course is not exactly a wetland, but after four inches of rain in August, it is pretty soggy. And Evans says that the methane bubbles usually appear during the wet seasons: spring and fall. Walter Anthony thinks rainwater may be pooling above a layer of impermeable permafrost, creating the conditions for methane production. After about 20 minutes of searching, we finally find what we’re looking for. Evans points it out. The bubble is sort of flat, not like the bigger ones that Evans has described as beach balls that bulge up out of the ground. But when you tap the ground with your foot, you can definitely tell that it’s not normal grass. It wobbles like Jell-O. “It’s kind of like an air mattress,” Walter Anthony’s colleague Philip Hanke said. “Or a water bed,” Evans added. 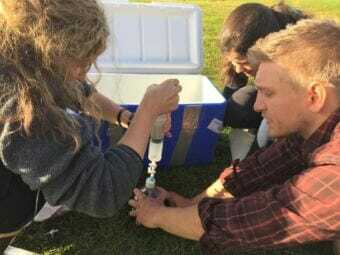 Using a syringe, a sawed off plastic bottle and a few other tools they rig on the spot, Walter Anthony and her team collect several vials of methane gas. She’ll use those samples to confirm that the methane really does come from thawed organic matter in the permafrost. She’s pretty sure it does, based on the obvious permafrost thaw all around us. But why is the methane forming bubbles? Walter Anthony cuts up a square of the soil to take a look at what’s underneath. “It’s probably that little silt layer right there,” Walter Anthony said, pointing. Walter Anthony hypothesizes that the density and fineness of the silt combined with the layer of grass could make it hard for the methane to escape. All the traffic the golf course gets could be part of it too, compressing the top layer to make it even denser. That’s all interesting to Walter Anthony, but what she’s really curious about is if this phenomenon is happening elsewhere on land. “It’s an area that I and some other colleagues have started thinking about: can you get methane forming in terrestrial environments? But it’s a very new area of science,” Walter Anthony said. It’s a new area of science because grasslands and boreal forests are thought of as places where greenhouse gases are absorbed, not released. But as permafrost thaw increases in the Interior — releasing more trapped carbon — Walter Anthony wonders if that’s changing. That would be really important for scientists to document and build into climate models, since potential emissions from the ground could contribute to global warming. Walter Anthony says that none of this is definitive yet, but that’s why it merits further study. “I’m probably going to go hiking through the woods… and look for some gas bubbles,” Walter Anthony says.